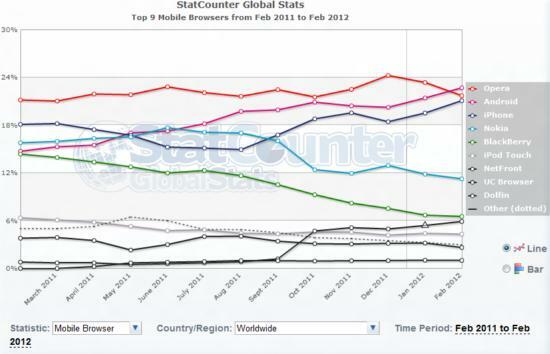 Android native browser becomes the most popular mobile web browser overtaking the Opera mobile browser. Statcounter stats reveal that Android browser “robot” overtook Opera mobile this month to become the most used web browser. 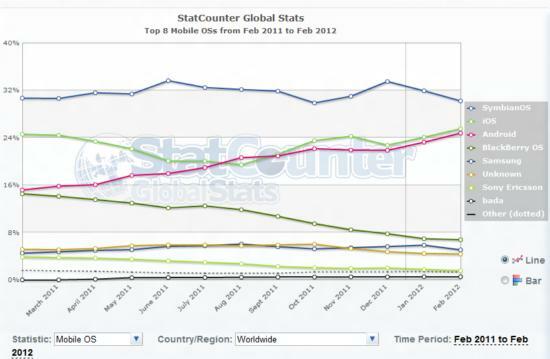 Mobile browser stats for the period Feb 2011 to Feb 2012 shows that both Android and iPhone are growing in terms of popularity. Android saw an impressive growth starting at 4th position an year back, overtook both Nokia and iPhone browser in May 2011, and overtook Opera now. Opera is pre installed in some feature phones and Opera mini is available as an app for iPhone and Android OS. Opera has released Opera Mobile for Android and Symbian, and Opera mini for iOS. Opera aims to win the smartphone users with social network integration features. Android browser may be the top browser today in terms of popularity, it is interesting to see what itâ€™s position after Google pushes the Chrome browser for Android. Google released Chrome beta for Android last month but it is only available for Android 4.0 users, and today phones running with Android 4.0 Ice Cream Sandwich are may be 1%, once this browser becomes widely available for other Android versions itâ€™s market share will increase. Other interesting observation is that both Nokia and Blackberry are continuously losing market share, perhaps Android and iPhone might be gaining at the expense of these two. Statcounter data for Mobile operating system shows that Nokia Symbian OS is still the popular OS at about 30% overall usage. 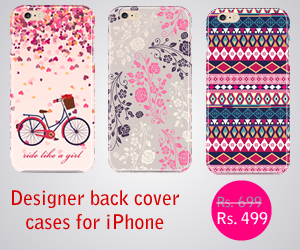 iOS and Android are going neck to neck with 25.49% and 24.76% respectively.